Idle No More Protest Closes Cornwall Bridge To U.S.
UPDATE: The International bridge has reopened, CBC reports. Police in Cornwall, Ont., have closed the International Bridge as hundreds of protesters march as part of an Idle No More protest. The protest is one of a series of demonstrations from First Nation groups calling on the federal government to work with them to discuss the issue of aboriginal treaties. Protesters were also set to march on the Deh Cho Bridge in the N.W.T. and the Peach Arch border crossing in B.C. on Saturday. The movement, and a hunger strike from Attawapiskat First Nation Chief Theresa Spence, has pushed up a meeting with First Nation chiefs to Jan. 11. But protesters have said that is only a first step and they do not believe the meeting will solve their concerns, which mostly stem from Bill C-45 — the omnibus budget bill. 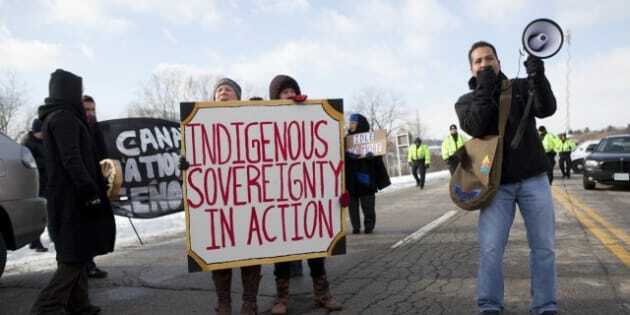 Idle No More protesters have said the bill hinders their treaty rights. Cornwall police Sgt. Marc Bissonnette said police do not know how long the protest will last. He also said drivers travelling to and from Canada should check ahead for road closure information and consider using alternate crossings. The last time the bridge closed for anything other than a traffic collision was in 2009, during a dispute between the Akwesasne Nation and Canada Border Services Agency over armed border guards. The bridge was closed for more than a month.